Polly will be traveling again! We’re heading west to visit my sister in Portland, Oregon and my cousins in Utah. 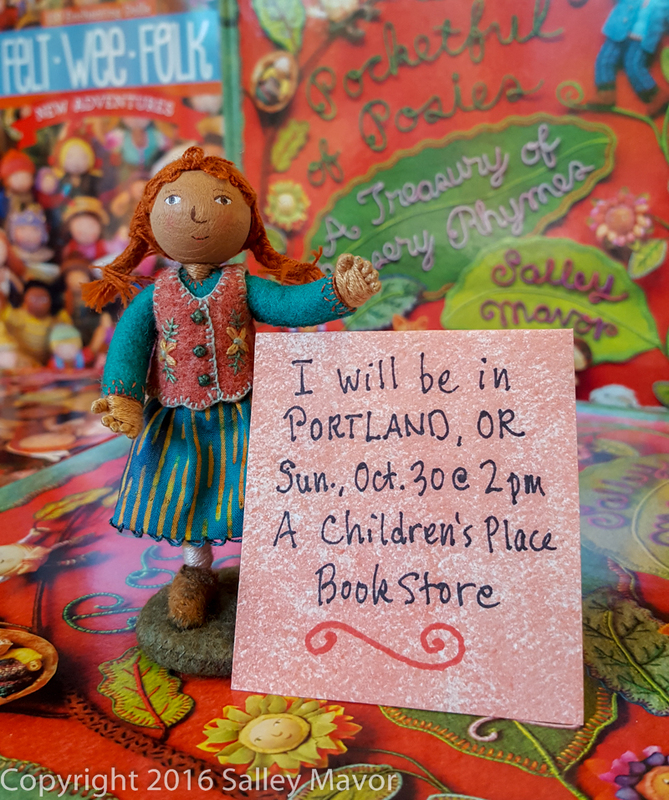 During a visit a few years ago, I had the pleasure of meeting several blog followers at a talk/book signing in Portland, so I thought it would be nice to arrange another event while we’re in town. This time, I will talk briefly about my work and sign books on Sunday, Oct. 30, 2016 at 2:00 pm at A Children’s Place. Polly needed a new outfit for the trip, of course. She decided on a colorful cotton batik skirt and turquoise top to compliment her favorite red vest. 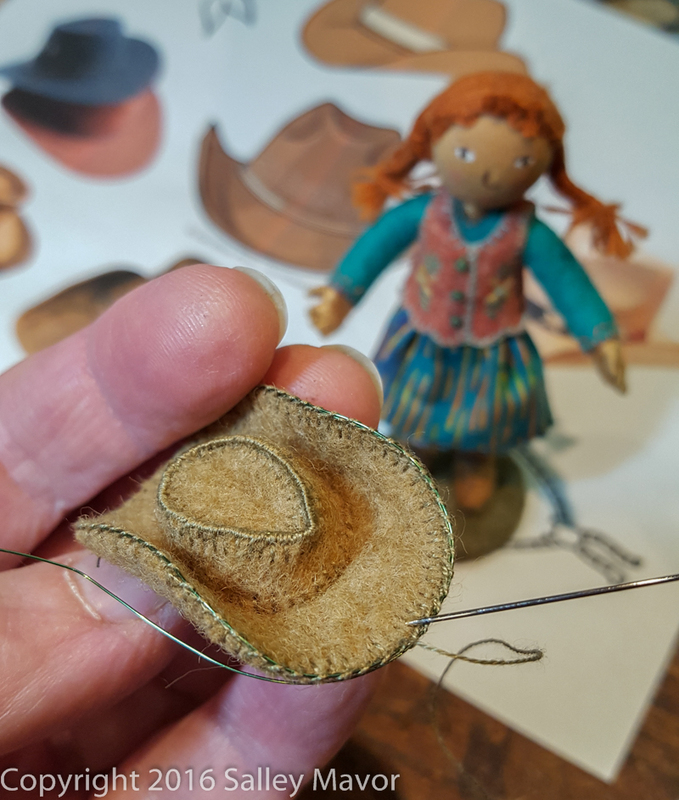 She’s always had a weakness for western attire, so I made a custom cowgirl hat. 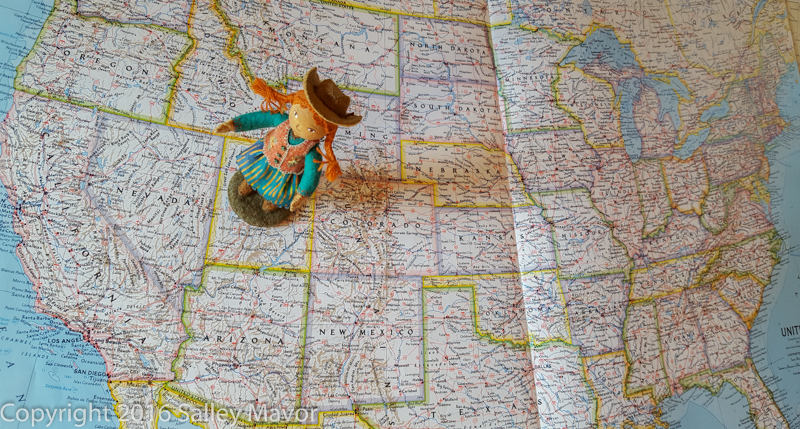 Polly is excited to be traveling west, across the whole continent and looks forward to sharing her adventures on Instagram and Facebook. 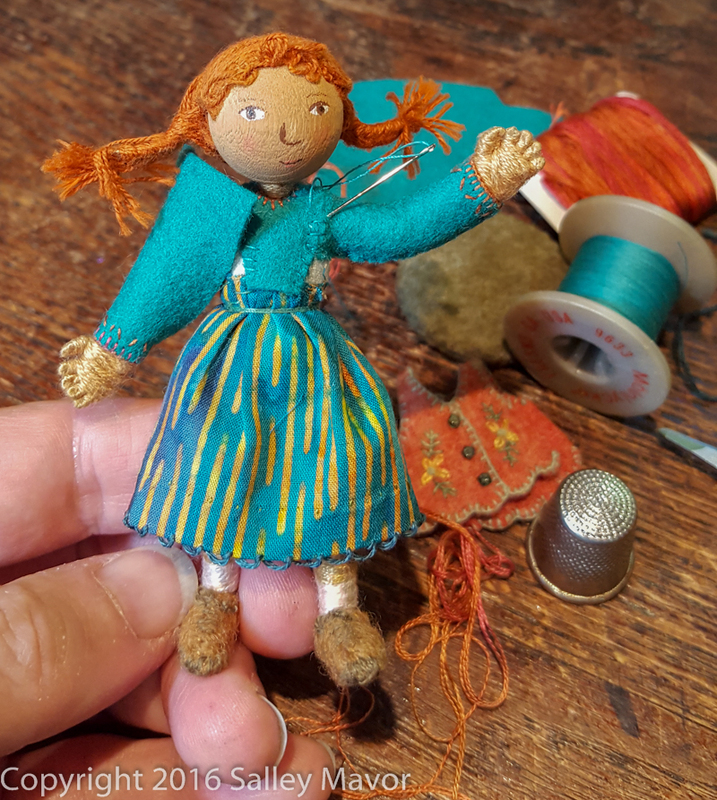 This entry was posted in Children's Books, Dolls, Events, Felt Wee Folk, Polly Doll by Salley Mavor. Bookmark the permalink. 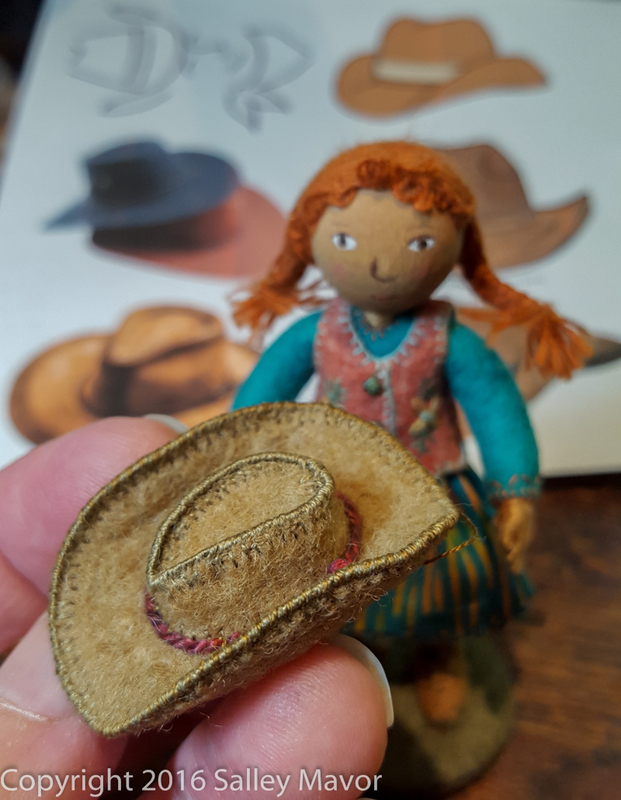 Polly looks like a great adventurer in her lovely new outfit and dashing cowgirl hat. Happy travels! Safe travels Polly and I love that cowboy hat of yours! Polly is so fashionable! Can’t wait to meet her (and you) in Portland! Safe travels! Thanks, I’m looking forward to meeting you, too! Just reminds me of how much I wanted to ride a stallion in the Old West in AZ which my dream was fulfilled. I only had levis to wear as the young heroine in a western story Zane Grey. I am so happy to see Polly. I hope you have a great trip. Love the hat. That hat is something else! Although Polly might find herself more in need of a rain parka or umbrella in Portland. I look forward to seeing you both on the 30th. Yes Nancy, Polly will have to get one of those Cinese parasols. I look forward to meeting you! Good idea Meredith! Maybe later this winter. I hope some day Polly (and you) will come to Colorado! So glad to see that you and Polly are coming to Portland!! I live in the Tacoma WA area and I’m planning a road trip with a couple of friends to come visit you on the 30th. So exciting!!! How wonderful Teresa! I look forward to meeting you and your friends in Portland.